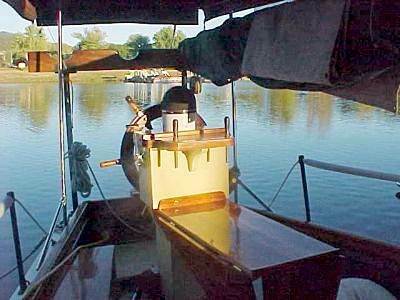 This adventure is about a wooden boat I fell in love with in the1970's and owned for almost 25 years. 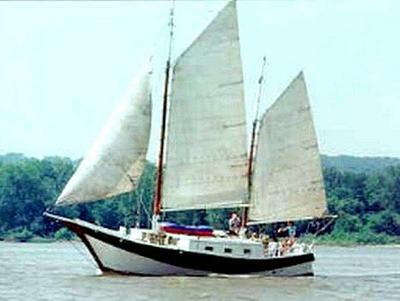 She was a home built 37' gaff rigged center board ketch based on Gerald T. White's Grey Dawn II plans, Westlawn & Assoc. of New Jersey. She grosses 12ton and is 37ft. on deck, 14ft. on the beam. 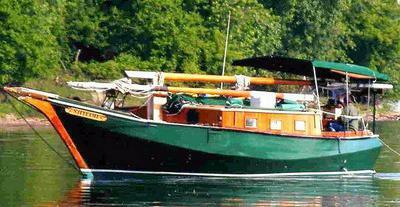 "Shiloh" was built over a 7-year period and launched in 1963 in Peoria, IL by Porte Wheeler, a DIY builder of the boat. But unfortunately, Porte passed soon after she was launched and never had the opportunity to enjoy his dream. I first spotted "Shiloh" at dock behind a home on the Illinois River at Chillicothe Il. 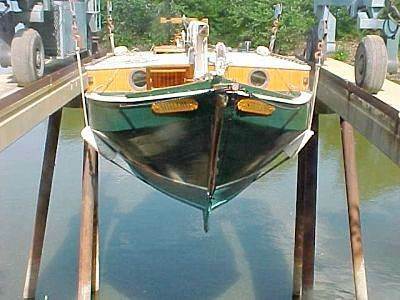 My opportunity to buy her came some years later in April 1982 after she had sunk the previous February at her dock in Hamm's Harbor. One of several sinkings I came to find out later. I paid $4,000 for her which seemed like a lot except she had a new 30hp. Yanmar diesel for an auxiliary. Also, I could always get my money back by salvaging the good stuff. Instead, I spent the next 25 years restoring-rebuilding Shiloh from what you see in the picture taken in 1982 to the picture of Shiloh on her way to Kentucky Lake, Tennessee June, 2005. Shiloh was towed from Hamm's down the river to Seaway marina, her home port, with the help of fellow sailors. To the surprise of all, the move came off without incident. Shiloh was originally built using a variety of native Illinois woods including hedgerow (Osage orange), white oak, fir, pine, cherry, cedar and sycamore. 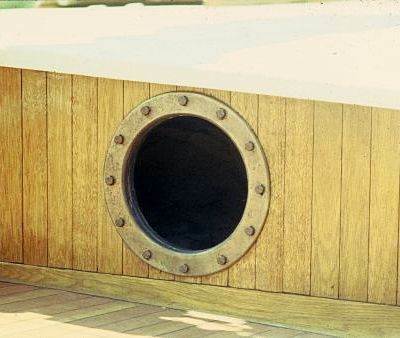 Marine plywood was used under fiberglass for the decks and cabin top. This combination made for a challenging restoration project. In fact, it is because of this combination, the project became one of reconstruction and redesign. A word about Shiloh's construction. The keel, sampson posts, and mast tabernacles are hedgerow. 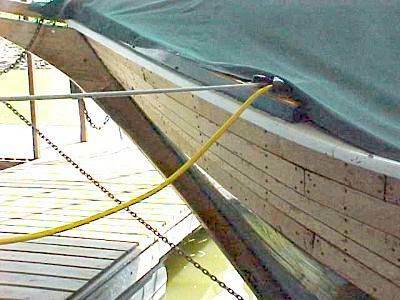 She drew less than 3 ft. at the barn door rudder when the center board was up, 6 ft. with it down. 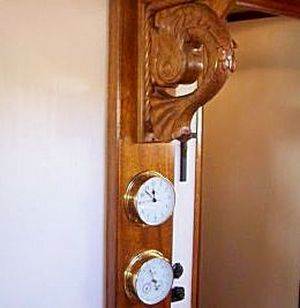 Hull planking was a combination of 11/8 in. sycamore from the gunwale down to the first chine, 11/8 in. square strip sycamore planks starting at transom and the first chine down to the bottom chine all the way forward to the stem. Bottom planks were 11/4 in. fir fastened to white oak and hedgerow floors at a diagonal to the keel. Frames are on approximate 12 in. centers. With the help and encouragement of friends and others, here's what I did with Shiloh while in my care. Making her seaworthy is a good place to start. May, 1982: Two weeks is what it took to get her back in the water. I took the hull to bare wood, ripped all the seams below the waterline (which included removing all the grit between the strip planks which was the main cause of her sinking), caulked and painted her. Shiloh was put back in the water and sailing, never to sink again on my watch. Speaking of seams, a friend of mine was down below tinkering with the engine when he called up to me on deck. “Hey, I see water through the planks down here! “Are the seams above or below the waterline?” I asked. We weren't without our humor. Her seams above the water line were always open if it was dry until I did something about it. Sycamore expands and contracts with the weather more than other woods. I believe that the tree commonly known as American Sycamore is a type of Plane tree. I live in Britain and my life has been spent in the timber trade in varying roles and I am considered by my peers to be quite knowledgeable. My wife doesn't always agree. What I find to be at odds with my experience is the American boat trade seem quite at ease using Sycamore to plank with. I have seen several references to it on this site and in fact I have left adverse comments in the past. I have seen this timber regularly for fifty years and would never suggest it should be used outdoors. Can someone tell me why the experience is different in America? I have looked at the botanical name and it would appear to be the same tree. At this point I would also like to praise my American Cousins for being far more interested in wooden boats than we are here but I don't get the whitewood for planking idea. 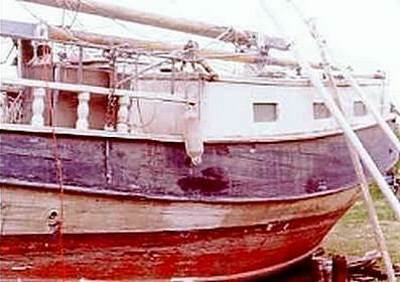 Over the course of time, "Shiloh’s" topside was completely redesigned and rebuilt using vertical grain fir for deck planks fore and aft after removing the fiberglass covering. This included removing the 12 in. bronze port lights from the cabin top and relocating them in the new forward cabin side. 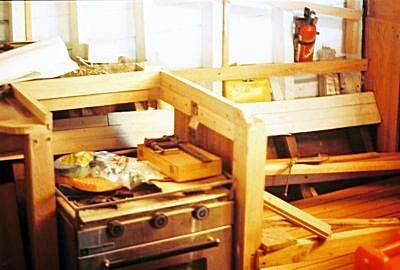 The cockpit was gutted and redesigned to provide for gunwale rails, seating and a mahogany drop leaf table which I built. 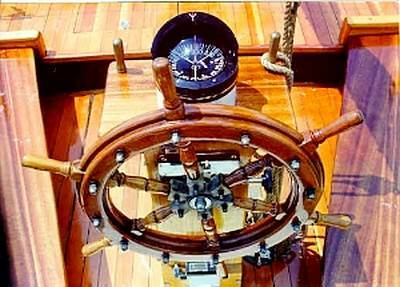 The new helm was built to accommodate the mahogany and bronze spoked wheel, engine controls and other instruments. The cabin top's fiberglass covering was removed and the roof recovered with canvas and sealed with epoxy glue. 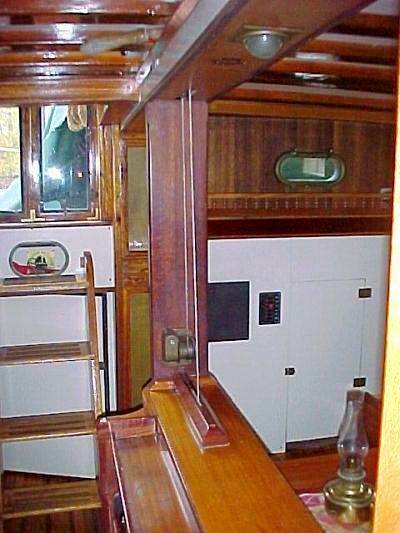 Twelve ft. grab rails I built of mahogany were added along the cabin roof port and starboard. 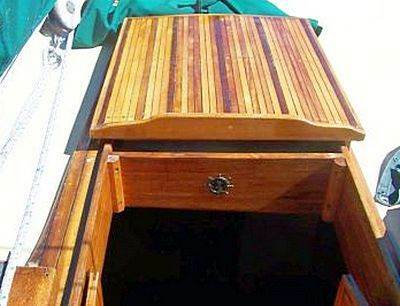 All sides of the cabin trunk were replaced with mahogany planking and the hatch and companionway covers rebuilt using alternating strips of mahogany, cherry, and hedgerow glued together. 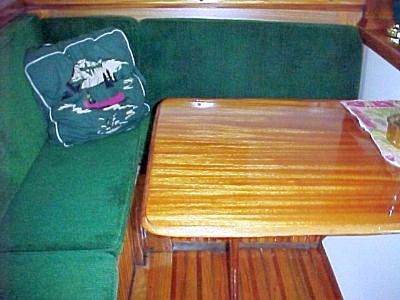 The decks, cabin sides, rails, table and seating were varnished bright. Since 1984, Shiloh was subject to three major refits and extensive maintenance, basically hull overhauls. While I loved her lines she was a devil to keep up. She didn't have any brightwork when I bought her. I added it all - a real labor of love. From 2000 to 2002, I replaced the hull planking from the gunwale to the first chine with sassafras, a wonderful wood, easy to work with and a good boat wood unlike sycamore, that squirrely stuff and very susceptible to dry rot. I also stripped the rest of the hull to bare wood (including having the bottom paint sand blasted off with corn cobs). I re-caulked the entire hull including gluing shims of oak into the wider seams with the caulk. Then I sealed all the wood with penetrating epoxy. Any wood I replaced was treated with the epoxy. The treatment stopped wood from expanding and contracting almost completely. I had to sand it off below the water line because the wood wouldn't swell enough to stop leaking! Also, paints used on the hull lasted much longer. That's the story of the topside and hull. A great deal of design work and construction also occurred below. The cabin was spartan with a main area and a small cabin forward. This would not do since I was planning on traveling some and maybe living onboard occasionally. As it happened, I lived onboard from fall of 1984 to spring 1991 until I married my wife Marsha - chief varnisher - at least for while (I proposed to her after having a dinner of tuna casserole that she cooked onboard using a toaster oven. Her response “this is all it took? A tuna casserole?”). Most all the interior work was done during this period of time. 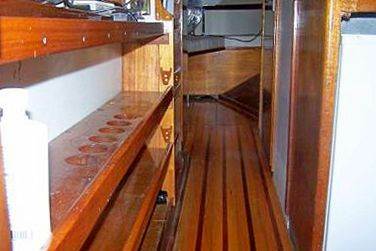 Cherry was used for walls and bulkheads originally. I reused it for the 6ft. 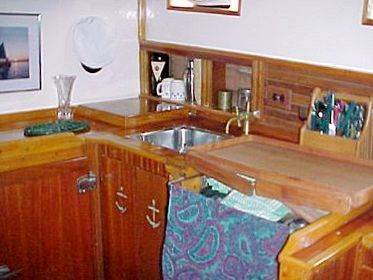 galley counter top which was on the starboard side. Cabinet doors and the ice box were from a 32 ft. Chris Craft cruiser that was on the burn pile at Seaway. Marsha, my sawzall and I salvaged the cabin stuff as well as its mahogany decks. They were used for new cockpit seats. Much of the woodwork below was in mahogany and cedar. The 5 ft. long center board trunk provided a great spot for a center shelf of mahogany. While building the shelves along the trunk, I decided to route the bilge pump discharge out through the trunk. 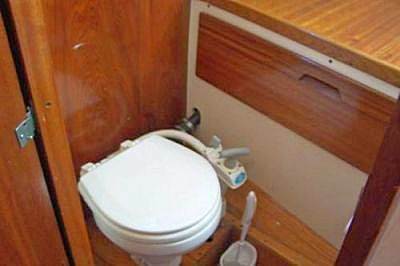 No one was going to see my boat pumping bilge water! Opposite the galley, on the other side of the trunk I built an L shaped dining settee with storage across the back and under. The table was from a pre-1930 motor yacht. 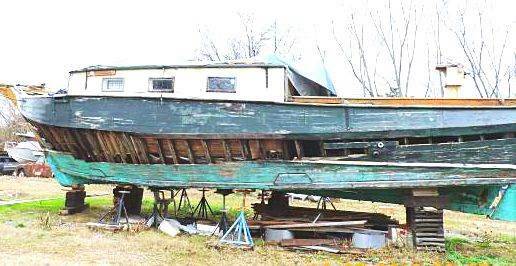 I have a 62 ft long 1924 Consolidated Shipbuilding commuter yacht in a shed on my farm. If some POS posted without talking to me that she was "Returning to the Earth", I would not only be insulted, but they’d probably be hearing from my lawyer as well. The first hint that a boat is unloved would be back rent. Shiloh’s is fully paid. I too visited Shiloh and took what you might regard as the unusual step of actually talking to the owners. As it turns out, the owners started minor repairs and found such shoddy repairs from a previous owner, that they decided a full restoration was needed. I saw the old work and agreed with them. Also, a previous owner had added a stainless framed cockpit canopy rendering the mizzen sail useless. The Ketch is effectively a sloop. I suggested changing her into a schooner rig. Understandably, for a project of that magnitude they wanted and have found a location free of mosquitoes with greater security for tools and more convenient to their residence. 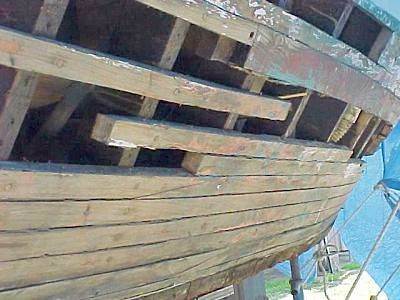 I expect the boat to be fully restored because the current owners seen to love her. I think your "Returning to the Earth" comment is baseless and cruel. Why didn’t you check your facts before posting? I wanted to post a final message about Shiloh. You read below that Randy Rollison, of The Waterfront Marina in Florence, Alabama found Shiloh at another marina nearby. Thankyou Randy for letting us know. Marsha and I drove to Flornce to see Shiloh. We were warned about her condidtion ahead of time but we wanted to see her anyway, one more time. Actually what we saw is what we expected. I have a folder on my computer called "Returning to the Earth". It has many photos of things that are over and done with - they are returning to the earth. That is the first thing that came to mind on seeing shiloh. I, for some unknown reason, fell for this boat back in 1975 or so, and in my mind's eye imagined what she could be. So, in 1982, I bought her off the bottem of the Illinois River. I saved her, and one man's dream from returning to the Earth at least for a little while. I'm thankful for the opportunity. This is Randy Rollison, I own The Waterfront Marina, in Florence Alabama. Enjoyed your writings about the Porte Wheeler 37' Shiloh. She's now in Florence, sitting on cribbing, in a friend's boatyard. 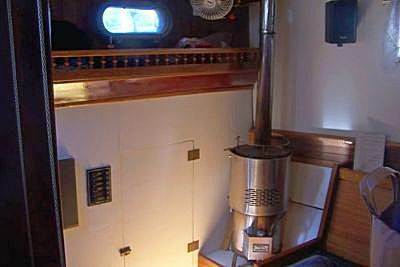 After one particularly cold winter, I installed a diesel fired cabin heater at the aft end of the "Shiloh's" settee. 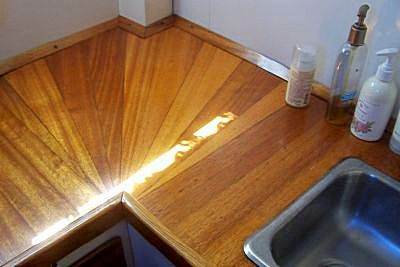 The cabin sole was made of strips of alternating oak and mahogany and treated bright. It complimented the rest of the decor very nicely. Forward of the galley I built the cabin for the head. I installed the holding tank for the head and the head itself. Over the tank, a mahogany counter top with a drawer for towels etc. was built. 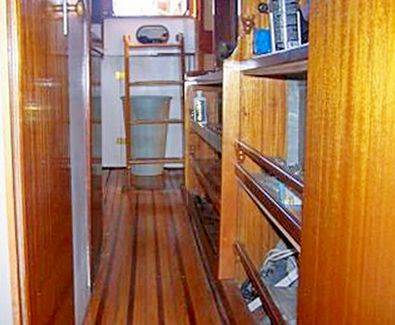 On the port side forward of the dining area was a 2 berth cabin with hanging locker, storage under. 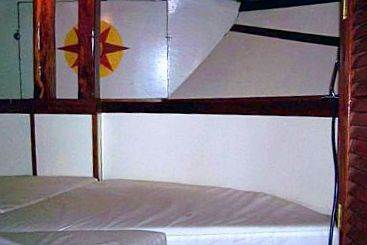 Full forward was the master's bunk built as a double with storage all around, a hanging locker and a full custom 4 in. thick mattress. 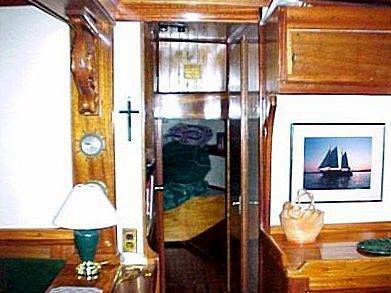 All the cabins had full mahogany trim and doors salvaged from one place or another. They were all lined with door skins painted gloss white. It took 5 years to get the cabin “livable”. Another 5 to finish it. 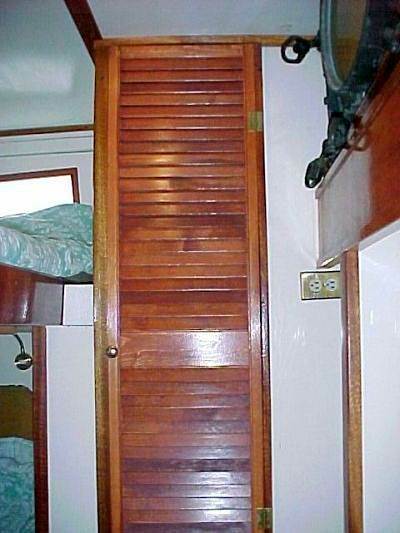 One note about the companionway doors. I made two door frames of the prettiest mahogany I had. 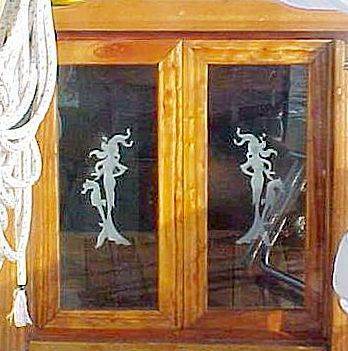 Then had glass panels made with mermaids etched into them and fit them to the door frames. Very classy touch, I'm proud of those. One last area needs mentioning; the running gear and the standing rigging. When I bought Shiloh, her standing rigging consisted of deadeyes lashed with hemp to stays at one end and the chain plates at the other. Booms were in bad shape and needed replacing. Fortunately, Peoria Tent and Awning was throwing away old tent poles. I refinished them and used them for both the gaff and main booms. The masts were Sitka spruce and refinished very nicely. The worn out sails were replaced with new (I blew out the main while racing another boat on Upper Peoria Lake, Shiloh held her own up to that point). All lines, halyards, sheets were replaced. We also added new sail covers and an awning on a with stainless steel frame. I have left out a lot of detail but I think you get the idea. 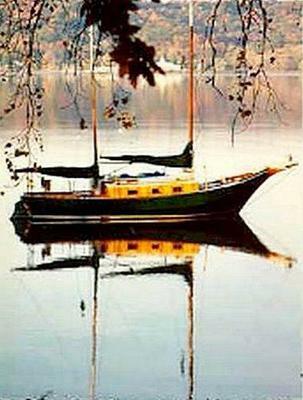 I was devoted to this boat because she was what I dreamed she could be. She represents a great deal of work and thanks to my friends, I was able to accomplish my goal of completing the dream I'm sure Porte Wheeler had. Through this lengthy process of restoration and construction, I experienced moments of frustration, humility, pride and delight. If you're wondering where all the materials came from, I was very fortunate to have a friend who worked for a lumber company and mill shop that was going out of business. I bought the vertical grained fir and loads of mahogany for pennies on the dollar. Another friend who is an electrician installed the AC electrical system. I was also very lucky to have friends who knew diesel engines and others who were pretty good woodworkers and those who just wanted to help. After moving to Tennessee, my wife and I sailed (usually motored) to various anchorages along the Tennessee and Cumberland Rivers with our dogs. Before that we took numerous eventful trips on the Illinois River and two trips up the Mississippi to Lake City, Mn. We had plans to go to the Gulf at some point but that was not to be. We have a lot of great memories of building Shiloh and enjoying our time with her. Because of health problems, we had to sell her in 2008. We've lost track of Shiloh and would really like to know where she is. If you have seen our Shiloh, please let us know. This story reminded me of how I began in the great hobby of building boats. As a child, my dad would take me to the harbor and I would watch the boats bring in their catch for the day. It all seemed very magical to a young boy. I started building tiny model boats but due to our family's financial situation, I could never graduate to building a "real" boat. Fortunately, when I grew up and started working, I was able to afford to build bigger boats. However, the plans that I found were incredibly difficult to understand and I never got past the "half-finished" stage. I was on the verge of giving it all up. Luckily for me, I came across some easy-to-follow instructions that have allowed me to complete some wonderful boats.